It was Round 6 and the Panthers came away with perhaps the most exciting victory in the SANFL this season, extending their unbeaten start to the season to five games and surging to the top of the SANFL League Ladder. After falling 35 points behind at the final change, the Panthers outscored the Crows 6.3 to 0.3 in the final term to come away with a famous one-point victory at Hickinbotham Oval. To add to the excitement, South Adelaide only took the lead in the final seconds after Daniel Bass coolly slotted a set shot from just inside 50 to put the icing on a dramatic win. In fact, the handful of seconds following Bass' goal were the only moments South Adelaide led all afternoon, with the Crows lead growing to as much as 41 points midway through the third term. However, South kicked nine of the last 11 goals, surging into the lead and leaving an Adelaide outfit sporting 18 AFL listed players shell shocked as the final siren sounded. Leading the way for the Panthers was Rigby Barnes whose 17 touches, eight marks, seven inside 50s and 2 goals were critical to the Panthers offensive game. Likewise, Brett Eddy continued to strengthen his case as the leagues best forward after another brilliant display in front of goals, kicking six for the afternoon. While the forward line fired, the Panthers defence held strong and held Adelaide to what was their lowest scoring output of the season and only goalless quarter of the season. The Panthers head into their final game of the minor rounds with a relatively clean bill of health. Jackson McMahon (fractured cheekbone), Sam Overall (groin) and Ben Darrou (groin) will all be tested during the week before they are cleared to face the Crows. Adelaide are also boasting a relatively clean bill of health. Former Collingwood wingman Paul Seedsman (corked buttock) and former Port Adelaide utility Keenan Ramsey (ankle) are listed as tests ahead of Round 22. Meanwhile, fellow AFL-listed trio Luke Lowden (ankle - 2-3 weeks), Alex Keath (back 3-4 weeks) and Sam Shaw (concussion - season) will be unavailable for selection. Keep an eye on the website on Thursday evening this week for the full Round 20 teams. Offensive Powerhouses: Both South Adelaide and the Crows are lethal forces heading forward, ranked first and second in the league for points per game. The Panthers have hit their stride towards the end of the season, reeling off four consecutive wins since losing to Glenelg in Round 15, including three by 49 points or more and two over fellow finals-bound competitors. Meanwhile, the Crows are also coming home strong as they did in 2015. Their 179 points against struggling West Adelaide in Round 21 is the most points scored by a team in 2016 and their 94 point margin of victory is the third highest this season (behind only South's 95-point win over West in Round 18 and Central's 107-point demolition of North in Round One). However, the ace up South Adelaide's sleeve remains their ability to play well at Hickinbotham Oval - where they remain undefeated through nine home games this season. The Panthers average margin of victory at Noarlunga is 31.4 points, with nobody coming within two kicks of beating them since they defeated the Crows by a point in Round 6. Both sides are locked in to play finals football come September, so this encounter will be an interesting contest for two teams that may be destined to meet again at Adelaide Oval at some point during the finals series. 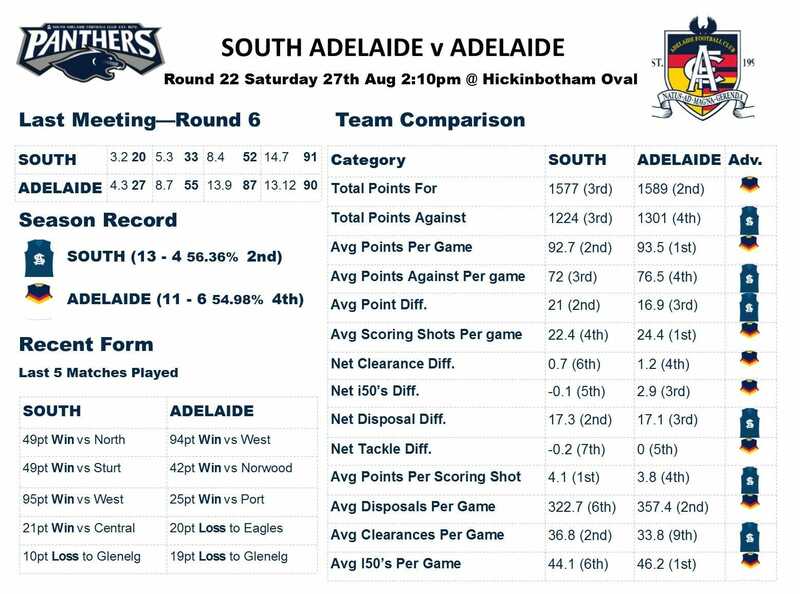 Both teams are devastating attacking forces, ranked first (Adelaide - 93.5ppg) and second (South - 92.7) for points per game and are both top three sides for total points scored in 2016 - Adelaide second and South third. However, each side plays a distinctively different style. The Crows accumulate much more of the ball, ranked first in disposals per game at 357.4, powered by the grunt of Cam Ellis-Yolmen and class of Mitch Grigg. Adelaide then bombard their opponents with a league-high 46.2 inside 50s per match. However, their leading goalkicker Harry Dear's tally of 29 goals is well off the pace of Ken Farmer Medal leader Brett Eddy's 63 for the season, indicating that the Crows spread their goal scoring around. The Panthers on the other hand are ranked sixth for disposals per game at 322.7 and sixth for average inside 50s at 44.1. However, South rank second in the league for clearances with 36.8 per game and are the most accurate team in the competition, converting 4.1 points per scoring shot - thanks in large part to dead-eye Dicks Eddy (68.5% accuracy), Rigby Barnes (87.5%), Sam Overall (75%) and Cam Hitchcock (68.2%). And while they don't rack up possessions at an astronomical rate, South's ability to shutdown opponents running game is evident in their ability to still win the possession battle on the day, as they average 17.1 more touches (third in the league) than their foes. It is the battle of the leagues' best offences. One team that bombards their opponents with forward entries, one team that dominates the clearances and takes the direct path to their accurate forwards. Who will come out on top? Can the Panthers sweep their home games 10-0? Be there to find out! Remember, it isn't home advantage unless you are there!